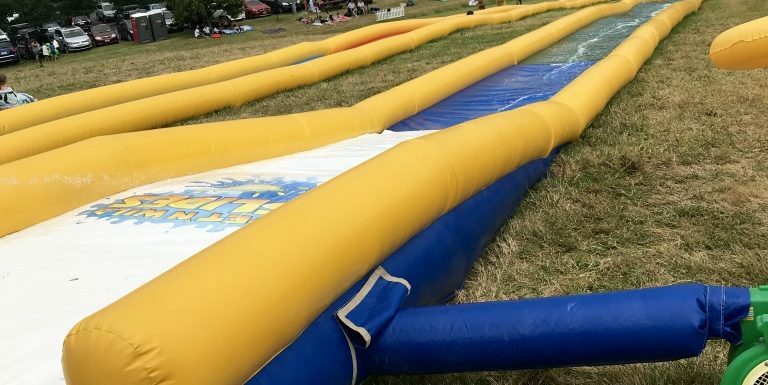 A couple of weeks ago, I took my six-year-old and his friend to some pop-up waterslides, set up on a temporary basis for a few weeks while school was out over the summertime here in New Zealand. The boys were booked in for a two-hour session so I traipsed up the hill with them at the start and made sure they were safe and having fun. Then I retreated to the shady parents area and sat back to read my book. Ahhh, bliss. I hadn’t even contemplated going on the waterslides myself. Although there were five slides set up, only one was available for adults to go on (weight restrictions etc.) so it didn’t seem like it was worth my time or money. Not many other grown ups were on the slides. My swimsuit was in the car but it was soaking wet from an earlier trip to the local swimming pool. Plus, I had a good book to read. But after a little while I just couldn’t get the thought out of my head that I would absolutely regret it if I didn’t go down that waterslide. I stopped being able to concentrate on my book as a little voice deep inside me kept insisting I go down the waterslide. Like, right now. Go! In our heads is a little area near the brain stem called the amygdala, and it prompts us to constantly scan for anything that can kill us. As this is a survival tool from a primitive era, the author, coach, and wise soul, Martha Beck, describes this part of us as ‘The Lizard’. Our lizard brains tell us things are dangerous even if they really aren’t. Here is a selection of what my Lizard told me – it will feel yucky to put on a wet swimsuit again / you will look silly as one of the only adults on the waterslide / that waterslide does look quite big and scary / the water will be chilly / you will freeze at the top of the hill while waiting to go down again / what if you swimsuit comes down (happened when I was young, mortifying) / the hill to get back up again looks steep / you will stand on a bee or something sharp with bare feet while walking back up / the session is half over so you won’t have enough time to get ready / it will be a waste of money. My lizard brain can be prolific! Then I remembered that this lizard is just a naughty chatterbox living in my brain – it is not me. It is certainly not the core me who knew deep in my soul that I simply HAD to go down that waterslide or I would REGRET it. I observed all the negative and fearful thoughts and then told my lizard it was being silly. It was allowed its opinion but it could now shush as I was going to go on the waterslide anyway. 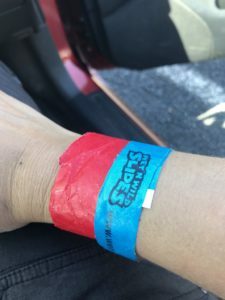 So I bought my half-price $5 ticket (discounted as less than an hour to go), raced to get changed into my almost-dry swimsuit and headed for the waterslide. I ended up going down that waterslide at least 10 times! It was honestly the most fun I have had in a very long time. Earlier that day – OK, I admit it, most of that week – I was feeling tired and irritable. It was nearing the end of school holidays and I was sick of the kids complaining they were hot / bored / had nothing to do. I was quick to snap at minor transgressions and had to really strive to act like the loving mama I aim to be. Going on the waterslide changed all that. It was so awesome that I was charged up, not just for the rest of the day, but for quite a while after. I truly believe going down the waterslide helped me get through the rest of the school holidays with a smile on my face. Plus, Dylan was thrilled that his Mama had unexpectedly joined him on the waterslides. He and his friend stopped going on the other slides and joined me on the one slide I was allowed on. We all had an absolute blast racing our way down to the bottom together (I won every time). I have a goal this year to have more exercise in my life – to move every day. Well, that day, I found myself walking/ running / stumbling up the hill after each waterslide – over 10 times. After the first waterslide, I was excited to get back up to the top of the hill as fast as possible to get in as many slides as I could before the session ended. I didn’t even notice that I had incorporated exercise into my day until I woke up the next morning wondering why my calves were a bit sore. I never would have thought that deciding to go down a waterslide would enrich my life, but it really did. I got to practice shushing my lizard brain, be the fun mama I always want to be and incorporate my exercise goal easily into my day. Unfortunately there are no photos of me on the waterslide but it will be in my memories forever. Hi, I am Julie. With my blog and books, I help people focus on the best parts of their lives - spending time with their beautiful tiny humans and doing what makes their hearts sing.